Finding a record of your Kerry ancestor’s baptism or birth is the ultimate goal of everyone tracing his or her ancestry. So why can’t we find some baptismal records? What were the norms surrounding baptisms in 19th century Kerry? What details are included in baptismal records? Each Catholic Parish is responsible for and has ultimate control over the recording of its parishioners’ baptism record. It is not a Diocesan function. This means in effect that if a particular parish wishes to make public or not make public its records, that is their entitlement. Nineteenth century Baptism records were kept in ledgers with details entered in pen. The earlier the baptism (pre-1850) the less information there may be on the original record. The minimum information includes the date of baptism, the name of the child, the child’s father’s full name, the mother’s Christian name and the name of the godparents (sponsors). Most original records would also indicate if the child was born outside of marriage. 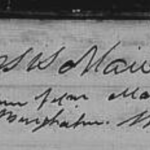 As the nineteenth century progressed, more information was set down, including the date of the child’s birth if it differed from the date of baptism, the mother’s full maiden name and the townland address. In the majority of parishes, the details were entered and written in Latin. The original registers of all Kerry Catholic Parishes with the exception of Killorglin were microfilmed by the National Library of Ireland in the 1950s and digitised in 2016. The images of the original Catholic Parish Registers available online at Registers.nli.ie are a marvellous resource and and are available up to 1880 or 1900 in some parishes. 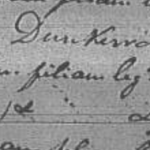 On these pages you can see the original record of your ancestor’s baptism and you can also see any note that the priest of the time might have entered. The entries are almost all in Latin. They are not indexed on this website but have been indexed on FindMyPast.ie. and free of charge. Transcripts of the baptism (and marriage records) of the Catholic Diocese of Kerry to c. 1900 are available free of charge on this website Included also are the Catholic Parishes in the Diocese of Kerry located in the Beara Peninsula in the County of Cork. These transcripts were compiled in a county-wide scheme in the late 1990s and are mostly good but there are a few parishes that have been poorly transcribed – wrong dates, names incorrectly noted etc. Due to the ages of the original records, some in poor condition or illegible, it was not always easy to transcribe of lot of these books so it is always advisable, once you have a date for your baptism, to then check it on the original register at www.registers.nli.ie. From a genealogy point of view, these early baptisms are a plus for researchers. This is where the Sponsors come in. The role of a Sponsor was to encourage and support the Child’s spiritual upbringing, particularly in the event of the death of a parent. A lot more attention should be given to the Sponsors – who were they and why were they chosen? Sponsors, usually one male and one female, were almost always chosen from the immediate or wider family – aunts, uncles, cousins or neighbours. In that period a large percentage of the population lived in rural settings and very few had any means of transport other than to walk. If one needed to call on a sponsor at short notice, then the nearest family members or immediate neighbours would be the first choice. Examining the names of the sponsors pays dividends in getting more background information. If for example if there are no sponsors for most of the family, holding the mothers’ surname it may indicate that she is not a native of the townland the child was born in. This would also hold true for the father’s family surname. Maybe the father was an ‘only’ son, maybe he was a ‘claimhán isteach’ (he ‘married into the place) from another parish. If there are family names as sponsors, who would they have been? The mother’s sister? Her brother? Griffiths Valuation 1852 and the Census of Ireland 1901/1911 may be checked – are neighbour’s names on the townland of the birth family? The Church of Ireland records have had an equally perilous history. Virtually intact until the fire in the Public Record Offices in 1922, those that had not been kept in Kerry in local custody or at least a copy kept, perished in this unfortunate fire. It is possible to see some Church of Ireland Parish records on Irish Genealogy.ie, it is possible see some on the alternative sources outlined here or some have been deposited in the Representative Church Body Library in Dublin. 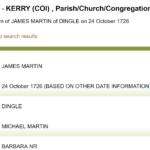 What might be the reason that I can’t find my family’s Kerry baptismal records? Records may not be extant in your family’s parish. Check dates that individual parish records start here. Maybe you are inputting the wrong or too much information to your search site. Remember that the date you found on your ancestor’s death certificate or census record is only a guess – Irish people generally did not know (or care about) their years or dates of birth. So input a range of years. Input the least amount of information for the best results. The more exact the information you enter, the less you will find. You will be more successful if you start off broadly, perhaps only with a surname, and then begin to narrow the search using dates, locations and forenames. Unfortunately maybe your ancestor’s birth has been recorded on one of the ‘missing’ pages or missing years. 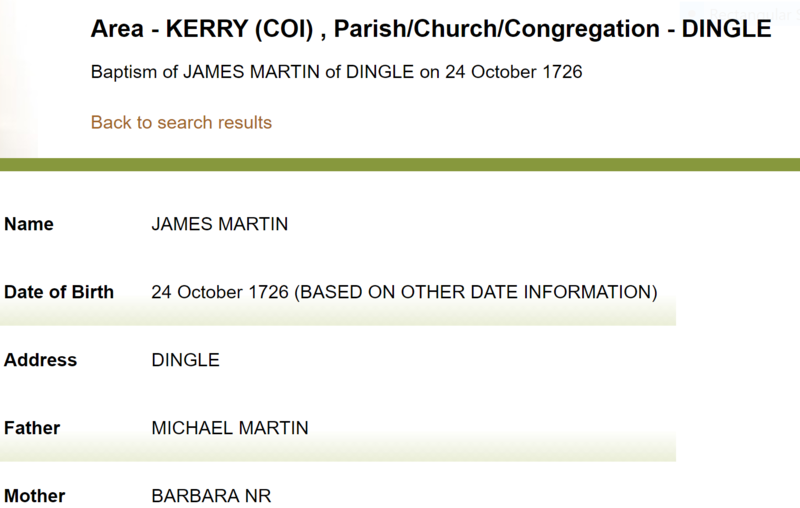 Unfortunately IrishGenealogy.ie will not tell you that this particular year or page is missing. So check a list here. You might ask why they are ‘missing’. There are a number of reasons – ‘lost’, ‘missing without explanation’, ‘fire’, ‘flood’, the ‘Black and Tans’, ‘illegible’. Some of these reasons are understandable. Due to the Penal Laws, it was not possible or legal for Catholic Priests to keep a record of Births or Marriages so very few records survive until the early to middle part of the 19th Century. Parish Priests of the early nineteenth century, particularly in rural areas, lived a precarious lifestyle, a number didn’t have a permanent residence, not to mention an office or parish clerk and it is a miracle that so many registers have in fact survived. They are often in a fragile state and may not be accessible to researchers. Civil Registration of Births/Marriage/Deaths became law in Ireland for Church of Ireland in 1845 and for Catholics in 1864. The indexes of these records are available to view and copy certificates to purchase to researchers who visit the Government Registration Office, Werburgh St., Dublin. These Civil Records are also available on Irish Genealogy.ie. All Baptisms are online from 1864 to 1917, Marriages from 1864 to 1940 and Deaths from 1864 to 1965. As per data protection obligations the last year is updated annually. It is also possible to view the original record forms in most cases. Once you have found your ancestor’s name/es just click on the link to bring up the image. Splendid information. I’ll change the way I’m inputting and see if i get better results. Hi Kay, hope you and Arthur are keeping well. This is a very important and informative article. Keep up the good work. I have been able to discover so many extended family members through using baptism sponsor names. It is such a valuable source. Do you think it was a practice in those days for the parish priest to travel to the home of the newborn to perform the baptism? Can’t imagine carting a newborn who is only a few hours old to the location of the church…. Thanks Kay. Very valuable information. Would like to add another caveat to search techniques when using the indexed web sites. My relatives came from Caherscullibeen Townland, Ballyferriter Parish and the records exist. I know this as I had searched and found them at the Ballyferriter church and in the National archives when I visitd Ireland years ago. Unfortunately, Caherscullibeen has had a number of spellings over the years and there are multiple spellings in the indexed version. The search tool is very specific and in order to find all records, all the spelling variants must be input separately if one is trying to reconstruct the population and inhabitants of the Townland. As you suggest readers should start with wide parameters first and use any resultant spelling variations to fine tune. My first great-grandfather is Maurice Horan 1842 – 1929 who was born in Tralee Kerry and I gather his parents were Timothy Horan 1811 – 1871 and Ellena Dee 1811 – 1896. I am unable to locate any birth records and your guidance would be appreciated. Graham, there would appear to be something wrong with the basic information here. For instance where is your source for the birth/baptism of Maurice – parents’ names or location? If you wish I can send you a Query Form which has targeted questions and on return I can I can advise. i found your article on kerry baptisms very informative and useful. 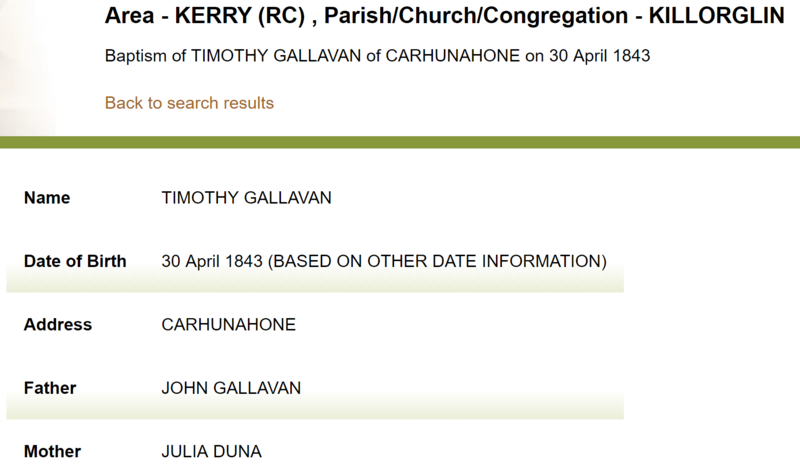 there is a hugh trove of detail relating to my own parish killorglin via irishgeneology .ie which was great as im constantly updating our family tree.what i found strange and somewhat bizarre is that killorglin parish is the only parish in kerry not to have their baptismal records available through the national library (nli.ie). is their any particular reason for this strange omission? kay-again great work& thanks for providing this source of family history for future generations. Michael, that is one of life’s mysteries! There is no explanation as to the reason that Killorglin is missing off http://www.registers.nli.ie. My own personal belief and I stress ‘personal’ is that I believe that the Parish Priest of the time did not want it pubished and would not allow the records to be microfilmed. As the records are not ‘public’, they are the responsibility and in control of each individual parish and he would have been entitled to take this decision. Killorglin is not the only church parish recorded on http://www.registers.nli.ie – the Parish of Prior (Ballinaskelligs) is also missing. 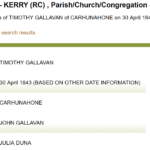 But the real point that I wanted to get over in the Kerry Baptisms blog, is that for a variety of reasons, some baptism and marriage records are not on any website or may not be extant in any written format as they have not survived the passage of time. Difficult to accept – but that is the way it is.